This two bedroom mid-terraced fully furnished property is situated a short walk from the popular Lisburn Road and Belfast City centre. Located off Donegall Road the property is in an ideal location for those seeking to travel to Royal Victoria and Belfast City Hospitals and is positioned within walking distance to businesses located on the Boucher Road, also has easy access to all public transport links. The property consist of a spacious fully furnished Lounge leading to a Kitchen with newly fitted high & low level units and worktops complete with all new electrical appliances and provides dining facilities. The WC / Shower Room has a white bathroom suite, power shower with walk in double shower enclosure. The two Double Bedrooms offer new double beds, mattresses, double wardrobes, chest of drawers and bedside lockers. Viewing is highly recommended and available by appointment. ENTRANCE: uPVC insulated door part glazed. LIVING ROOM: 4.27 x 3.15m (14' 0" x 10'4") Spacious living room with wood effect laminate flooring, built in shelving and furnished with IKEA two seater settee and two lounge chairs. STAIRS & LANDING: Recently decorated & newly carpeted. KITCHEN: 4.14 m x 2.92 m (13' 7" x 9' 7") This modern kitchen and dining area has ceramic wall & floor tiling, new high and low level kitchen units, worktops, stainless steel sink and drainer c/w mixer tap and all new electric appliances consisting of integrated ceramic hob & single oven, stainless steel recirculating cooker hood, washing machine, fridge / freezer, and table & chairs, with access to large storage area under stairs. REAR HALL: Has ceramic tiled floor leading to WC / Shower Room and a uPVC part glazed external door giving access to Enclosed Yard. WC / SHOWER ROOM: 2.11 m x 1.96 m (7' 1" x 6' 5") Provides a white bathroom suite consisting of a low level cistern toilet, pedestal wash hand basin & mixer tap, power shower with double shower enclosure, with PVC vinyl to floor and marble effect wall panelling. BEDROOM ONE (Double): 5.11 m x 3.96 m (16' 9" x 13' 0") Large double bedroom with new carpet and furniture consisting of double bed, two double wardrobes, three drawer chest of drawers & two bedside lockers. BEDROOM TWO (Double): 2.95 m x 2.77 m (9' 8" x 9' 1") Double bedroom with new carpet and furniture consisting of double bed, three drawer chest of drawers. Front paved area with boundary wall, railings & gate and a secure Enclosed Yard to rear with access gate to Entry. CENTRAL HEATING: Gas fired central heating (GSC available on request), radiators in every room c/w thermostatic controls. Gas PayGo Meter is installed along with Carbon Monoxide Alarm. ELECTRICAL: All electrical installations recently tested (EICR available on request) & Electric PayGo Meter, Smoke Detectors are installed along with Energy Efficient Lighting throughout. GLAZING: All windows & external doors are uPVC double glazed, windows fitted with vertical blinds. DECORATION: All rooms recently decorated and new flooring installed throughout consisting of wood effect laminate flooring, carpet or ceramic tiles. 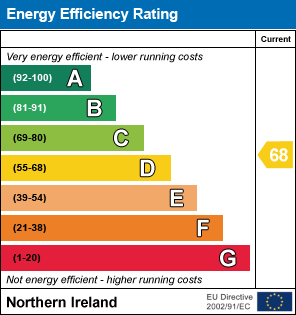 EFFICIENCY PERFORMANCE CERTIFICATION: Energy Efficiency Rating D68 / Environmental Impact Rating D67 (EPC available on request). PARKING: On street parking available. I am interested in 15 Richview Street, Belfast. Please contact me about this property.